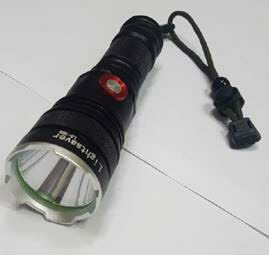 This SWAT law enforcement flashlight’s strobe effect allows security and law enforcement officers to shine a light on criminals or dangerous individuals in low light or dark condition. It is robust enough to withstand any amount of man-handling. Easy to operate, with five mode settings, including a whopping 900 lumens on full power. The SWAT flashlight has rechargeable Lithium-ion batteries with an alternative power source option which makes use of normal disposable batteries. This means that you need never be in the dark! It has a military spec casing and a super strong aluminium alloy body which makes it impact resistant when dropped from a height of 1.5m. It’s weather resistant and the 100 000 hour lifetime Cree 10 watt LED means that this flashlight’s lifespan is a lot longer than conventional globes. The SWAT’s built-in energy management system also gives it longer battery life. All round, you’d feel pretty secure in buying the SWAT flashlight, knowing that it’s effective in compromising situations, strong enough to last the night and, importantly, it’s good value for money as it’s such a quality product.